Planning your special day or event can be stressful - but it doesn’t have to be! At Dougs Hiring, we aim to make your planning experience fun, easy, affordable and really special. We therefore offer wedding, function and event rental and co-ordination services that you just won’t find elsewhere. With a wide variety of style, design and colour options, your event will be created to look and feel exactly as you please. At Dougs Hiring, we believe that the most memorable weddings are made up of a series of special moments, enhanced by unique details that complement the couple’s personalities and style. Accordingly, our options and ideas are endless, and are sure to please any bride and groom to be. We have a complete inventory of wedding rental items for the ceremony and reception, with everything you need under one roof. We will happily advise on your tent or marquee, tables, chairs, linen, décor, crockery, cutlery - and so much more - bringing together all the elements to create perfection. With Dougs Hiring on your team, you can rest assured that no detail will be missed. If you are not local, but are planning a wedding, function or event in the Lowveld, we welcome you to contact us via email, telephone or Skype. Although we operate mainly in and around Nelspruit and Mpumalanga, we also operate in Limpopo , Mozambique and Swaziland. 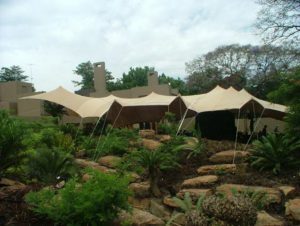 Dougs Hiring in Nelspruit, Mpumalanga, specialise in white peg and pole, aluminium frame or free standing marquee hire, as well as stretch tent or bedouin tent hire. We also provide draping where required. 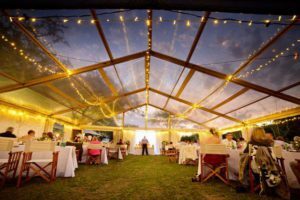 When selecting a marquee or tent for hire, factors such as the environment, type of function, number of guests and seasonal weather should always be taken into account. Sometimes, the exact tent that you might see in a magazine isn’t necessarily suitable for your purposes – however, we are usually able to deliver the same “look and feel” that you are after. Speak to one of our consultants to find out which tent is best suited to your specific needs. Traditional Pole Marquees consist of PVC, under tension by means of centre poles, side poles and guy ropes, which are attached to ground pegs that have been hammered into soft surfaces such as lawn or field. With sides that extend to the ground, these tents offer a great deal of protection from the elements. Clients can however decide how open they would like the tent to be, by leaving off the sides in certain areas. Aluminium Frame tents (also known as clear span tents) require no centre poles, thereby providing uninterrupted internal space. 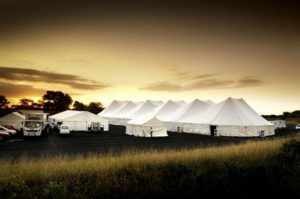 The highly stable ballasting system allows for the tent to be secured without the use of guy ropes or pegs and it can therefore be erected anywhere - and close to buildings or other tents. Clients can choose between PVC panels and glass panels, where glass panels allow guests to enjoy beautiful natural surrounds. Stretch tents are highly versatile and, with their aesthetic appeal, require minimal décor. Available in various heights, sizes and colours, there are many different options to suit any event and environment. They are quick and easy to set up and remove, providing shelter from the sun and rain, while maintaining a lovely, open-air feel. From beach weddings to garden tea parties, a Bedouin or stretch tent might just be the perfect solution for you. Sparkling glasses, radiant china, spotless cutlery and classy, quality furniture are all available for hire from Dougs Hiring in Nelspruit. Our helpful team will ensure that all your requirements are delivered to your venue, correct and on time for your special event. Standard, Elegant, Balon, Savoie, assorted juice glasses and martini glasses. Standard, Du Barry & Kings Pattern Silver Plated cutlery sets. Standard, Royal Porcelain, Octagonal and Square. We also stock assorted gold and silver under plates (charger plates). Dougs Hiring carries an extensive range of tables, chairs and linen to complement your theme. Beerfest bench and table, aluminium café sets, square tables, aluminium cocktail tables, wooden cocktail tables, plastic garden tables, round tables, trestle tables and conference tables. Tiffany chairs, wimbledon chairs, chrome Z-shaped bar stools, banquet chairs (with or without chair covers), plastic chairs (with or without chair covers) and more. We also stock carpets and chandeliers. We stock a large range of catering equipment for hire, from outdoor barrel braai’s, gas grills and gas boiling tables to potjie pots in various sizes. We also stock chafing dishes, bain-maries, hot trays and hot cupboards. With many years of experience, we are able to assist you with advice on the type of equipment you will need for your function, how much equipment you will need and how to create the right look.